Running a business takes a lot of effort and time. Unfortunately, sometimes there isn’t much to show for it — competition could be too far ahead in the game, or you could be struggling to attract and retain customers. In the competitive market of today, every detail can significantly impact your bottom line. Being customer-centric in today’s business climate is always a good thing. As long as you’re providing your customers with a great experience, they will be more likely to become repeat customers. And one of the pillars of delivering service that makes them want to come back is being accessible at the customer’s convenience. Online scheduling makes that possible by being available for the customer 24/7. When making an appointment, a customer is free to consult their schedule in peace and come up with a time that works best for them. Additionally, they can avoid talking on the phone if they so wish. One of the advantages of your business is that it takes significantly less time to maintain appointment scheduling. A dedicated receptionist isn’t necessary, as taking care of automated scheduling is mostly about checking whether everything is running smoothly. In addition to that, implementing online programming is a massive step towards going paperless, which is a huge advantage for any business cost-wise. Finally, automated scheduling frees up valuable time that you would otherwise spend on the phone with customers. Sometimes new technologies are complicated to implement and require changing how you do everything. Naturally, that can put businesses off of the concept. However, the times are changing. Technology is more accessible than ever to everyone. Becoming able to use new technologies competently doesn’t have to be difficult or require a lot of training. There are online scheduling software solutions that are both easy to implement and to use, all the while providing your business with features that make appointments into an automated process. It might take some getting used to, but the advantages and increased efficiency make that worth it. Want to Reap the Benefits of Online Scheduling? Automated appointment scheduling has advantages that no business can afford to ignore. If you want to reap the benefits of the online schedule, we can help you take the first step. 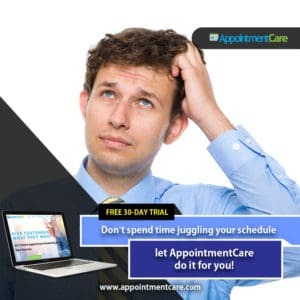 At Appointment Care, our scheduling software can help you leverage the power of automation and aid your efforts in building a successful, modern business. Start your free trial, and enjoy the advantages of online scheduling that will get you ahead of the competition.